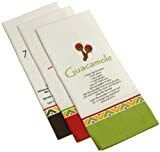 DII Salsa, Guacamole, and Seven Layer Dip Printed Dishtowel Set of 3 adds flare and style to your kitchen with its fun -inchfiesta-inch motif. Each set includes 3 towels each printed with the following recipes: guacamole, seven-layer dip, and salsa. Measures 18 by 28-inch. 100-percent cotton.